The Science Museum of Minnesota has one of only four mounted Triceratops in the world. The Science Museum's specimen, which can be seen in the museum's Dinosaurs and Fossils Gallery, is actually a composite of two individuals, but it is the largest and most complete Triceratops specimen on display anywhere. Many more specimens of this largest of horned dinosaurs are housed in the Paleontology Department collections as well. 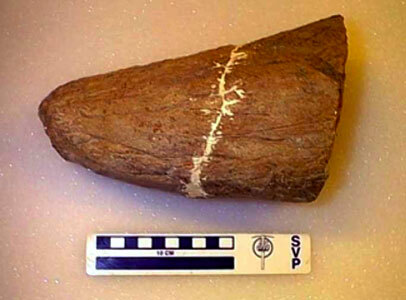 When Triceratops horn cores were first discovered, they were identified as fossil bison horns. No one at that time could imagine a giant reptile with massive horns. When more complete skulls were found, the error was corrected.